The following selection of maps supplies a brief history of the changing geographical dimensions of Canada as a colonial possession of the British Empire, pre- and post-confederation, to 1870. What the maps make apparent is that, to that year, at no time was the western boundary of the Canadian frontier closer to Red River Settlement than 700 kilometers (as the crow flies). The straight line distance between the seats of government, Upper Fort Garry and Ottawa, was some 2,078 kilometers. Prior to 1763 Canada was a colonial possession of the Ancien Regime of France. After the American War of Independence, during which thirteen colonies rejected British colonial rule, the extent of British North American possessions changed again. With the Constitution Act of 1791, the British Colonies in North America were again reorganized. [viii] [ix] The Province of Quebec was essentially divided into two separate colonies: the Province of Lower Canada (within present day Quebec — on the lower reaches of the St. Lawrence River), and the Province of Upper Canada (within present day Ontario — up the river). The Union Act of 1840 combined Upper Canada and Lower Canada into the single Province of Canada, which nevertheless retained division between Canada East and Canada West. In 1867, the British North America Act [BNA] stated that, "the Provinces of Canada, Nova Scotia, and New Brunswick shall form and be One Dominion under the Name of Canada. "[xii] Sections 5 and 6 of the BNA Act then divided the Province of Canada into the Province of Ontario and the Province of Quebec. Online Resource: “Map of Canada in 1867,” Library and Archives Canada. The country of Assiniboia entered into confederation in 1870 with a new name, Manitoba. This occurred only after exchanges of animosity in the press; an initial refusal to accede to the summary take over of Canadian political representatives; and the formation of a representative and responsible government by the people of Red River Settlement (following a republican model with a President, Louis Riel, an elected Legislative Assembly with twenty-eight members, and an executive council drawn from its members), which composed a list of conditions — including that a railroad connect Manitoba to Canada — that were to be agreed to by the Dominion of Canada. Online Resource: “Map of Canada, 1870,” Library and Archives Canada. Note the geographical change since 1867. [i] See for example, Archer Martin, The Hudson's Bay Company's land tenures and the occupation of Assiniboia by Lord Selkirk’s Settlers, with a list of grantees under the Earl and the Company (London: William Clowes and Sons, 1898), who describes locations in the settlement without the help of maps. 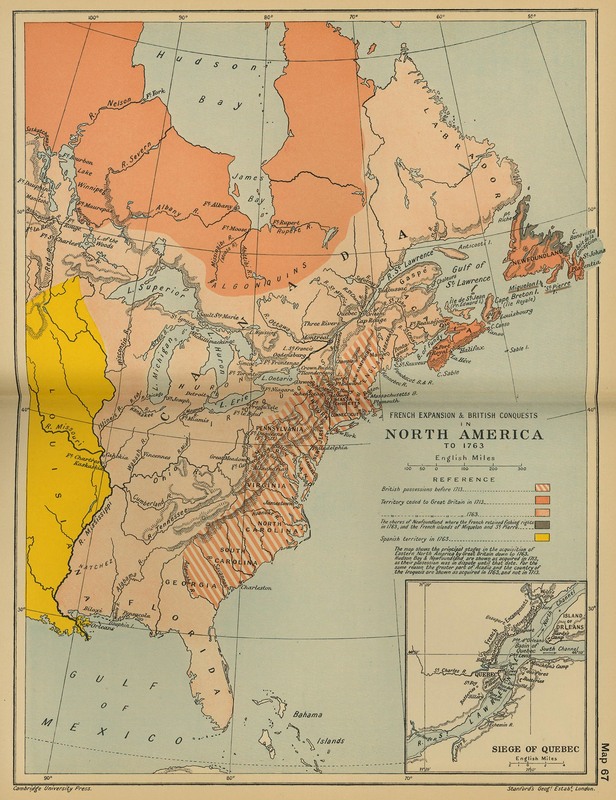 [ii] “French Expansion and British Conquests in North America to 1763,” University of Texas Libraries, University of Texas at Austin, http://www.lib.utexas.edu/maps/historical/ward_1912/america_north_french_british_1763.jpg. [iii] See W.J. Eccles, "The Seven Years' War," Canadian Encyclopedia; and "Seven Years' War in Canada," L'Encyclopédie de l'histoire du Québec / The Quebec History Encyclopedia, Marianopolis College website. In 1763, the Treaty of Paris conceded all of New France to Great Britain, with the exception of the Saint-Pierre and Miquelon islands off Newfoundland (which were fisheries). See also "Treaty of Paris (1763)," L'Encyclopédie de l'histoire du Québec / The Quebec History Encyclopedia, Marianopolis College website. [iv] William F. Maton, transcription, “The Royal Proclamation October 7, 1763,” Solon Law Archive, http://www.solon.org/Constitutions/Canada/English/PreConfederation/rp_1763.html. [v]Sayer, Robert, 1725-1794 -- Cartographer ;Anville, Jean Baptiste Bourguignon d', 1697-1782 -- CartographerRobert de Vaugondy, Didier, 1723-1786 -- Cartographer [Public domain], via Wikimedia Commons, A New Map of North America (1763). [vi] See William F. Maton, transcription, “The Quebec Act, 1774, 14 George III, c. 83 (U.K.),” Solon Law Archive, http://www.solon.org/Constitutions/Canada/English/PreConfederation/qa_1774.html; and the “Quebec Act, 1774,” Early Canadiana Online. [vii] “The Quebec Act: Introduction,” Canada: A Country by Consent, http://www.canadahistoryproject.ca/1774/index.html. [x] “1791,” Historical Maps of Canada, Canadian Geographic online http://www.canadiangeographic.ca/mapping/historical_maps/1791.asp. [xi] “The Act of Union 1840,” Éditions Brault and Bouthillier, http://www.ebbp.ca/series/en_wallmaps/images_large/wallmaps_25.jpg. [xii] William F. Maton, transcription, The British North America Act (renamed the Constitution Act in 1982), Solon Law Archive, http://www.solon.org/Constitutions/Canada/English/ca_1867.html. [xiii] British Columbia confederated in 1871, largely due to the efforts of newspaper owner and politician Amor de Cosmos (a.k.a. William Alexander Smith, originally from Nova Scotia), and largely because of a promise of railway linkage to the east. Prince Edward Island finally joined in 1873. After having first considered joining the U.S., the colony was lured to Canada in part by the promise of a ferry link to the mainland, and the promise that the federal government would pay for the island's railways. View “Map of Canada, 1873,” after the inclusion of P.E.I. Newfoundland initially rejected confederation (see “Anti-Confederate Propaganda, 1869,” Morning Chronical, St. John's (29 Sept 1869), and did not agree to confederate until 1949. By then the transportation promise that held appeal was the extension of the Trans Canada Highway across the province.